One year ago, I wrote to you about my enthusiasm in becoming the Chief Executive Officer of a foundation I had come to respect when I was its grantee. I wrote about the global threats that were growing against women, girls, and LGBTQI people and about how these challenges also provided opportunities for movements to come together with renewed purpose, determination, and creativity. I unequivocally urged philanthropy to take braver risks and make bolder investments in the activists on the frontlines of progressive change — particularly women and trans people of color — not simply because it is what targeted communities need to survive the day-to-day, but because it is what is required for movements to carry out long-term, transformational strategies. The clarion call of last year has been amplified by what we continue to witness globally: a swell of authoritarianism and racist nationalism, backlash to feminist advances that hold men accountable for sexual assault, alarmingly inhumane treatment of immigrant children and families, violent attacks on press freedom, and environmental catastrophes that unduly affect poor and Indigenous people. There is no question that democracies around the world are in distress — and that is, in part, because movements that are led by those most affected by injustice have gained power and strengthened solidarity. Every regressive strike is further evidence that activists are focused on the right things — like gender and racial justice, sexual liberation, bodily autonomy, and labor rights. To be under attack is an affirmation that what movements are doing is working: they are transforming societies into ones that recognize and respect the essential dignity of all. As social justice movements create new forms of resistance and powerful visions of change, philanthropy must act courageously by sharing resources in ways that are responsive to what activists say they need. It means embracing risk, supporting experimentation, and making room for setbacks. It means cultivating relationships that are based on trust and grounded in humility. It means giving more funds with more urgency and giving grantee partners the space to set their own priorities, seize opportunities, and shift tactics quickly. It means being flexible and reliable, listening deeply, and learning from mistakes. Staff worked with external consultants to seek qualitative feedback from grantee partners, philanthropic allies, and movement leaders about the gaps in our work, areas where we should place greater priority, and how we can strengthen our regional, global, and journalism grantmaking approaches. 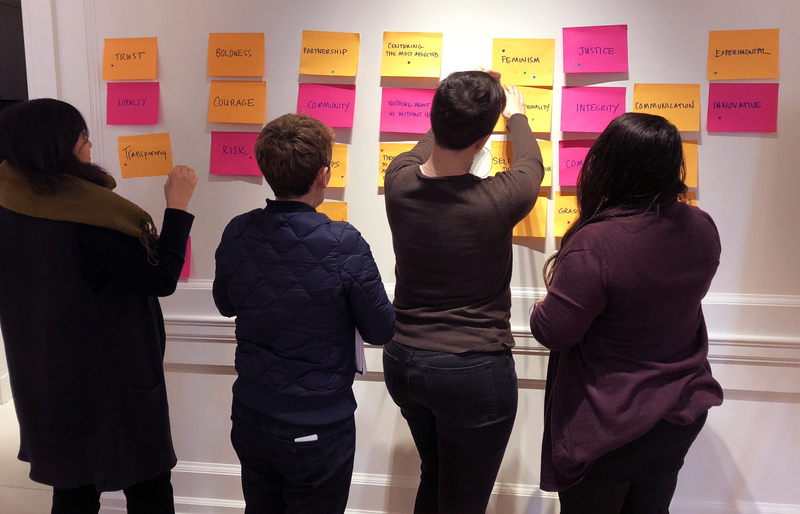 We hired strategic planning consultants who developed and led a process with our staff and Board that included an in-depth analysis of our mission, vision, values, and how we believe change happens — and support to develop a five-year strategic plan. FJS knows that a philanthropy that aspires to support deep, transformative change must follow the lead of activists, organizations, and movements — and that means listening, learning, and adding value when we are uniquely equipped to do so. We are grateful to all who contributed their time, intellectual and emotional labor, and trust to the process of determining what our added value is and can be. We have heard you, and we hope you will see the ways your input has directly informed our future directions. In some ways, the reflections we heard confirmed what the foundation already does: provide reliable, multi-year, general operating funds through a grantmaking process that avoids requirements that are needlessly complex or might exclude those we wish to support. We were advised to stay the course on this approach and not make major adjustments to it. Do even more to reach and support the leadership of organizations led by women, girls, and LGBTQI people most affected by injustice and overlooked by philanthropy — especially Indigenous and Black women, low-wage workers, people with disabilities, and girls. More intentionally support feminist movement building that strengthens the ecosystem and cultivates alliances that move forward shared agendas for change. Examples of how we’ve been encouraged to do this include funding a broader array of grantee partners and facilitating strategic convenings to deepen relationships across organizations and movements that advance gender and racial justice. Increase investment in robust, grantee-driven, capacity support (which we will call “accompaniment”) that complements our general operating grants in ways that benefit both organizations and the field, especially in the areas of strategic communications and holistic safety and collective care. Seize opportunities to transform the public conversation about women, girls, and LGBTQI people by integrating strategic communications across everything we do — from supporting activists who leverage communications as a core strategy to ramping up our movement journalism grantmaking. Expand the geographic focus of our grantmaking within our existing regions to better reflect how movements are organizing, establish a local presence within the current regions, and gain a greater ability to respond to emergent situations. Step into a greater leadership role in philanthropy by redoubling our efforts to foster collaboration and strategy alignment with other funders in ways that sharpen our collective gender and racial justice lens, reflect a greater sense of urgency, and align more closely with what movements need to thrive. We embrace our responsibility to the activists who take risks every day and commit to act boldly in support of them and their movements — which includes a commitment to undertake these shifts. The learning journey we have traveled this year produced a roadmap that will guide the foundation’s work to deepen, expand, and diversify our investments in movements that advance the rights of women, girls, and LGBTQI people. And we are happy to share some exciting news about our strategic directions over the next five years. We have listened, assessed, and reflected on the valuable insights we have received and used these insights as the basis for our future directions. Although the specifics of our grantmaking, accompaniment, communications, and philanthropic advocacy strategies are still in development (and we plan to roll them out in early 2019), we are able to share a few of the commitments that will be reflected across these strategies. FJS seeks to double our annual grantmaking by 2023. Multi-year, general operating support that advances the rights of women, girls, and LGBTQI people and promotes gender and racial justice will continue to be the core of our grantmaking. However, we will also experiment with increasing our support to participatory funds, providing seed funding to emerging organizations and networks, and making larger and longer-term investments to key anchor organizations that play critical roles in the resilience of feminist movements. FJS will provide more accompaniment support. In the past, we have been deliberate about staying out of our grantee partners’ way because we believe the people most affected by injustice are best equipped to design and carry out the solutions that will transform our world. But the feedback we received from our grantee partners showed that greater involvement on our end could be helpful, especially through an accompaniment approach that bolsters the safety and well-being of activists and enhances movements’ ability to effectively communicate the complexities of the problems we are facing and raise the visibility of solutions determined by those most affected by injustice. FJS will speak out and take braver, bolder action to push philanthropy in the directions that movements want us to go. We have received tremendous encouragement to become a more visible leader in inspiring philanthropy to provide more and better resources that enable movements led by the women, girls, and LGBTQI people most affected by injustice to grow and become stronger. Activists are transcending generations-old rifts and creatively coming together with renewed solidarity. Philanthropic institutions now need to learn from them and also match their daring — not just by providing more and better resources, but by engaging in efforts to influence the field of philanthropy. As we grow into our next phase, FJS has brought on new program and grants management staff to support the already-increasing workload and ensure that we can responsibly take on what movements are demanding of us. We will share more details about our refined strategies at the beginning of next year. It continues to be an honor to work together, and we appreciate your partnership in creating our shared vision of a world where all people are equally valued and lead self-determined lives.